Or...as has been suggested...JA wanted to be 'artsy' and avant-garde and have his portrait taken in a photography darkroom. 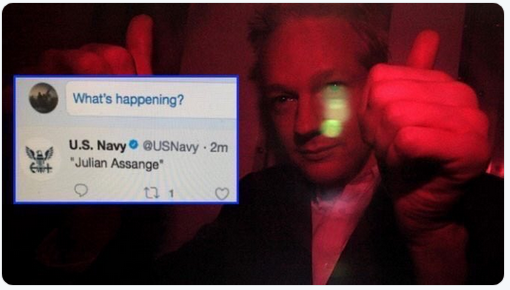 who wore the disappearing act better Assange or RGB? I listened to Sean Hannity interview Julian Assange twice. Here's a link to the first one, from January 2017. Assange speaking of MSM: "Why such a dramatic response, they are trying to delegitimize the Trump administration as it goes into the whitehouse. They are going to try to say Prez Trump is not legitimate....they will seize on it and harp on it for the next 4 years". There is neither green nor blue in that image. Did you hear our POTUS?